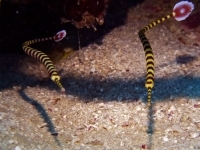 Thin and long pipefish with white/yellow body and red to brown encircling bars. It has a large red, fan-like tail with white margins and a white spot. They can be seen solitary, in pairs or small groups. Unassessed by the IUCN Red list. Uncommon species, that hides in caves and crevices or under ledges. Red Sea and East Africa to Samoa, north to Japan, south to Australia. Adults inhabit tide pools, lagoons, and outer reef slopes. Found in caves and crevices or under ledges, in a depth range of 5-56 meters. Ovoviviparous reproduction. The males carry the eggs in a pouch under the tail, until the pipefish are ready to hatch. Up t0 18cm, but usually smaller. They feed on small invertebrates. Ringed pipefish are shy, and will seek shelter when approached by divers. 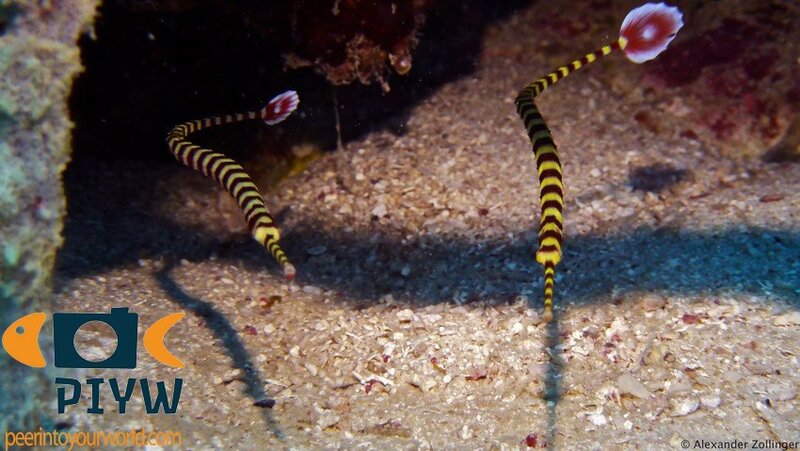 They are also referred to as banded pipefish. They were previously named Doryrhamphus, but that name was changed in Dunckerocampus.